Every summer, Weber Farm calls us to say that their farmer's market has opened because their first harvest of sweet corn has come in. Richard barks that out to all of us as an excited announcement. This is a thing we look forward to--because we sell the corn in our own on-farm market, but also because it's crazy delicious. 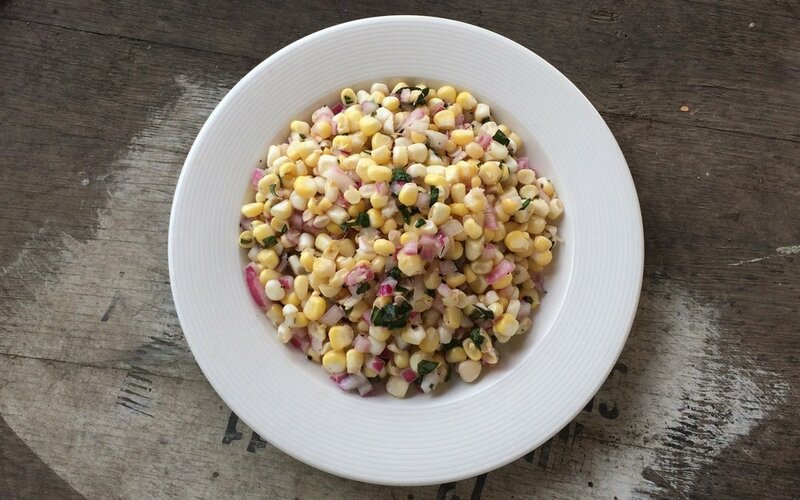 Here's a recipe for a simple cold corn salad that lets the natural sweetness of the corn shine. No cooking, just leave a bit of time for the salad to chill and for the vinegar to mellow out the onions. Cut the kernels from the ears of corn (we suggest doing so with one end of the ear resting in a deep bowl to catch the kernels as they fall. . . or occasionally shoot away from the ear). Toss them in a large bowl with the onion, vinegar, oil, salt, and pepper. Taste and add salt or pepper or vinegar as your taste requires. Cover the top of the bowl with a lid or plastic wrap and chill in the refrigerator for 2 hours up to overnight. Immediately before serving, add in the basil and mix gently but well.